Quakertown, PA (April 18, 2019) Bruce Kenworthy of QNB Bank was recognized for serving 50 or more years in the banking industry at the Pennsylvania Bankers Association (PA Bankers) Group 2 meeting held on April 8th at the Rivercrest Golf Club in Phoenixville. The 50-Year Club consists of bankers completing 50 or more years of service in Pennsylvania’s banking industry who are regular members of the PA Bankers. Bruce Kenworthy has served the banking industry for 51 years. Currently, he serves as Assistant Vice President, Business Development Officer at QNB Bank. Bruce holds a Bachelor of Science in Economics from Ursinus College with a minor in Accounting. He is also a graduate of the Bucknell School of Banking. Additionally, Bruce’s article “Grass Roots Marketing Can Grow Profitable Business” has been published in the ABA Banking Journal. Formerly, Bruce served in multiple managerial positions for Philadelphia National Bank, followed by Bucks County Bank and First Union Bank. Quakertown, PA (February 26, 2019) The Board of Directors of QNB Corp. (OTC Bulletin Board: QNBC), parent company of QNB Bank, at a regular meeting on February 26, 2019 declared a quarterly cash dividend of $0.33 per share. The amount represents a 3.1% increase from the prior quarter. Based upon the closing price of a share as of close of business February 22, 2019, this represents a yield of 3.5%. The cash dividend is payable on March 29, 2019 to shareholders of record March 15, 2019. “As a result of the continued solid financial performance of QNB Corp., the Board of Directors is pleased to be able to increase the dividend by 3.1%. As a result of its well capitalized position, QNB Corp. is able to continue its uninterrupted history of quarterly dividends,” said David W. Freeman, President and Chief Executive Officer. QNB Corp. offers commercial and retail banking services through the eleven banking offices of its subsidiary, QNB Bank. QNB Corp.’s stock is traded in the over-the-counter market under the symbol “QNBC.” For more information, visit QNB’s web site at QNBbank.com. Quakertown, PA (January 29, 2019) QNB has teamed up with TurboTax® to get your taxes done right. Through a marketing alliance with Intuit® Inc., QNB Bank customers can save up to $15 on TurboTax federal products. In addition, Intuit offers a TurboTax Free Edition for basic tax returns and free e-filing on all federal and state products. With TurboTax, taxpayers can easily prepare and file federal and state income tax returns online. TurboTax searches over 350 deductions and credits, so you won’t miss a thing. QNB’s customers can be confident that their returns are accurate and complete. This year, file your taxes the smarter way and get your biggest possible refund with TurboTax. Quakertown, PA (January 28, 2019) QNB Bank recently held its annual campaign to raise funds for United Way. Led by Patti Cole, this year’s campaign was the most successful yet, tallying up an impressive $32,423 from employees and an additional $6,484 from the Bank for a total contribution of $38,907. Quakertown, PA (January 28, 2019) QNB Bank has promoted Cheryl Morris to the position of Senior Vice President, Chief Credit Officer. In her role, Cheryl is responsible for measuring and managing the risk in the Bank’s loan portfolio. In addition, Cheryl oversees Credit, Documentation and Loan Servicing. 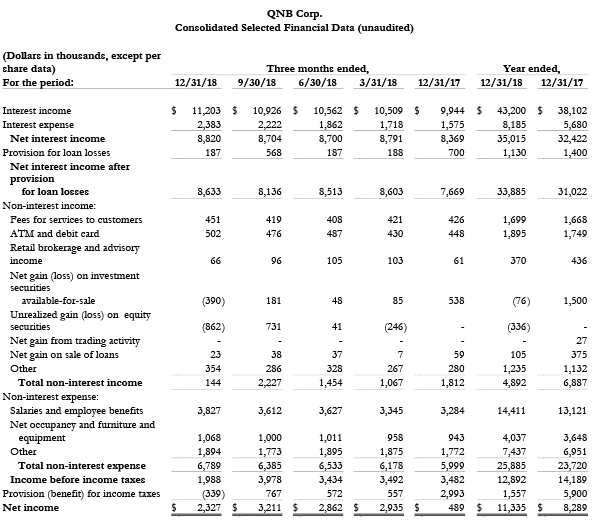 Quakertown, PA (January 25, 2019) QNB Corp. (the “Company” or “QNB”) (OTC Bulletin Board: QNBC), the parent company of QNB Bank (the “Bank”), reported net income for the fourth quarter of 2018 of $2,327,000, or $0.67 per share on a diluted basis. This compares to net income of $489,000, or $0.14 per share on a diluted basis, for the same period in 2017. 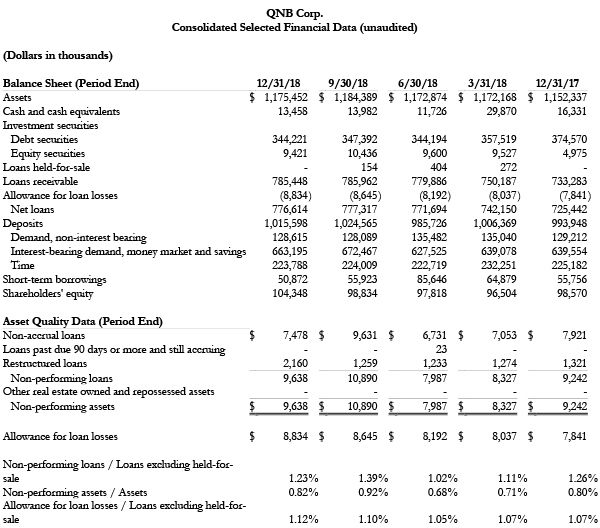 For the year ended December 31, 2018, QNB reported net income of $11,335,000, or $3.25 per share on a diluted basis. This compares to net income of $8,289,000, or $2.41 per share on a diluted basis, reported for the same period in 2017. For the year 2018 the rate of return on average assets and average shareholders’ equity was 0.96% and 10.47%, respectively, compared with 0.74% and 8.17%, respectively, for the year 2017. Both quarterly and year-to-date results in both years were impacted by 2017 tax reform, enacted in December 2017, detailed below in the “Income Tax” section of this earnings release. Total assets as of December 31, 2018 were $1,175,452,000 compared with $1,152,337,000 at December 31, 2017. Loans receivable at December 31, 2018 were $785,448,000 compared with $733,283,000 at December 31, 2017, an increase of $52,165,000, or 7.1%. Total deposits at December 31, 2018 were $1,015,598,000, an increase of 2.2% compared with $993,948,000 at December 31, 2017. Net interest income for the quarter and year ended December 31, 2018 totaled $8,820,000 and $35,015,000, respectively, an increase of $451,000 and $2,593,000, respectively, from the same periods in 2017. The net interest margin for the fourth quarter of 2018 and 2017 was 3.11%. Net interest margin for the year ended December 31, 2018 was 3.13%, a decrease of one basis point compared to the same period in 2017. The yield on average earning assets increased 27 basis points to 3.93% for the fourth quarter of 2018, compared with the fourth quarter of 2017. For the year ended December 31, 2018, the yield on average earning assets was 3.85%, compared with 3.67% for the same period in 2017. The cost of interest-bearing liabilities increased to 1.01% and 0.88% for the quarter and year ended December 31, 2018, respectively, compared with 0.68% and 0.64%, respectively, for the same periods in 2017. QNB recorded a $187,000 provision for loan losses in the fourth quarter of 2018, compared with $700,000 for the same period in 2017. For the years ended December 31, 2018 and 2017, QNB recorded $1,130,000 and $1,400,000, respectively, in provision for loan losses. QNB's allowance for loan losses of $8,834,000 represents 1.12% of loans receivable at December 31, 2018 compared to $7,841,000, or 1.07% of loans receivable at December 31, 2017. Net loan charge-offs for the year ended December 31, 2018 were $137,000, or 0.02% of total average loans, compared with net charge-offs of $953,000 for the same period in 2017. Total non-performing loans, which represent loans on non-accrual status, loans past due 90 days or more and still accruing interest and restructured loans were $9,638,000, or 1.23% of loans receivable at December 31, 2018, compared with $9,242,000, or 1.26% of loans receivable at December 31, 2017. In cases where there is a collateral shortfall on impaired loans, specific impairment reserves have been established based on updated collateral values even if the borrower continues to pay in accordance with the terms of the agreement. At December 31, 2018, $3,072,000, or approximately 41% of the loans classified as non-accrual are current or past due less than 30 days. At December 31, 2018 commercial substandard or doubtful loans totaled $18,339,000, compared with $16,647,000 reported at December 31, 2017. Total non-interest income was $144,000 for the fourth quarter of 2018, and $4,892,000 for the year ended December 31, 2018, a decrease of $1,668,000 and $1,995,000, respectively, compared to the same periods in 2017, respectively. 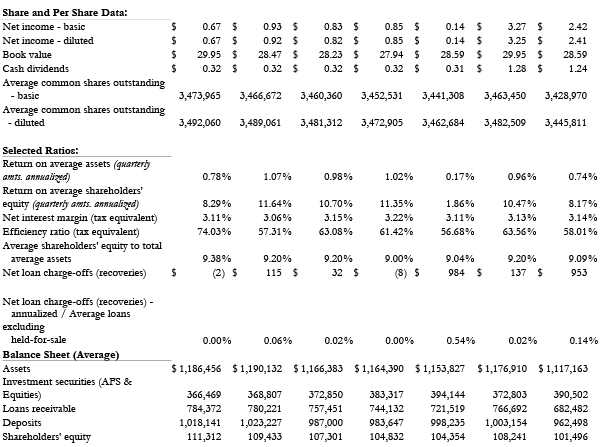 The decrease is due primarily due to combined realized and unrealized net loss on investment securities totaling $1,252,000 for the quarter and $412,000 for the year in 2018 compared with realized net gains on investment securities of $538,000 and $1,500,000, respectively, for the same periods in 2017. ATM and debit card income and fees for services to customers increased $54,000 and $25,000 in the fourth quarter 2018, compared with the same period in 2017. Other fee income increases include $48,000 recorded for a broker-dealer conversion cost reimbursement, a $17,000 increase in letter of credit fees, and $16,000 in credits earned for sale of checks. Gain on sale of loans declined $36,000, due to a slowdown in mortgage activity, due to the rising rate environment. Total non-interest expense was $6,789,000 for the fourth quarter of 2018, an increase of $790,000, or 13.2%, compared with $5,999,000 for the fourth quarter of 2017. For year ended December 31, 2018, total non-interest expense increased $2,165,000, or 9.1%, to $25,885,000, compared to the same period in 2017. Salaries and benefits expense increased $543,000, or 16.5%, for the quarter ended December 31, 2018, compared to the same period in 2017. Salary expense increased $272,000, accrued incentives increased $73,000, medical premiums increased $174,000 and retirement expense increased $38,000 for the fourth quarter 2018, compared with the same period in 2017. For the year ended December 31, 2018 salaries and benefits expense increased $1,290,000, or 9.8%, compared to the same period in 2017, for the same reasons detailed for the quarterly increase. Net occupancy and furniture and equipment expense increased $125,000, or 13.3%, for the fourth quarter 2018 compared to the same period in 2017, due primarily to increased depreciation, software, equipment, rent, and building maintenance and expense of $84,000, $35,000, $8,000, and $7,000, respectively. For year ended December 31, 2018, net occupancy and furniture and equipment costs increased $389,000, or 10.7%, compared to the same period in 2017, due primarily to increased software, depreciation, equipment and building maintenance, and rent expense of $154,000, $102,000, $63,000 and $21,000, respectively. Other operating expenses for the quarter ended December 31, 2018 increased $122,000, or 6.9%, due to increased marketing, consulting, state taxes, third party processing and FDIC insurance premiums. Other operating expenses for the year ended December 31, 2018 increased $486,000, or 7.0%, due to increased FDIC insurance premiums, state tax, and check card expenses. The effective tax rates for the quarter and year ended December 31, 2018 were -17.1% and 12.1%, respectively. This compares with effective tax rates for the same periods in 2017 of 86.0% and 41.6%, respectively. Both the quarterly and year-to-date tax rates were impacted by adjustments due to tax reform and lower tax rates. Provision for income taxes decreased $3,332,000 and $4,343,000 for the fourth quarter and year ended December 31, 2018, respectively. In December 2017, the Tax Cuts and Jobs Act was enacted, which reduced the corporate federal tax rate to 21% from 34%, effective January 1, 2018. The 2017 enactment date required the Company to revalue its deferred tax asset, which resulted in a fourth quarter 2017 charge of $2,054,000 to its 2017 tax provision. In the fourth quarter of 2018, the Company elected to change tax accounting methods for deferred loan origination fees and nonaccrual interest income effective for the 2017 return, resulting in a one-time $418,000 income tax benefit to 2018 tax provision. This one-time tax benefit takes advantage of the reduction in the federal tax rate from 34% to 21%. $1,559,000 of the decrease in tax provision in 2018 versus 2017 was due to lower effective tax rates, and $312,000 due to lower taxable income in 2018. QNB Corp. is the holding company for QNB Bank, which is headquartered in Quakertown, Pennsylvania. QNB Bank currently operates eleven branches in Bucks, Montgomery and Lehigh Counties and offers commercial and retail banking services in the communities it serves. More information about QNB Corp. and QNB Bank is available at www.qnbbank.com. This press release may contain forward-looking statements as defined in the Private Securities Litigation Act of 1995. Actual results and trends could differ materially from those set forth in such statements due to various factors. Such factors include the possibility that increased demand or prices for the Company’s financial services and products may not occur, changing economic and competitive conditions, technological developments, and other risks and uncertainties, including those detailed in the Company’s filings with the Securities and Exchange Commission, including "Item lA. Risk Factors," set forth in the Company's Annual Report on Form 10-K for the fiscal year ended December 31, 2017. You should not place undue reliance on any forward-looking statements. These statements speak only as of the date of this press release, even if subsequently made available by the Company on its website or otherwise. The Company undertakes no obligation to update or revise these statements to reflect events or circumstances occurring after the date of this press release. Quakertown, PA (January 25, 2019) QNB Bank has promoted Lori Pinkerton to the position of Assistant Vice President, Credit Manager. In her role, Lori is responsible for managing and participating in the underwriting process for commercial lending while training and developing new and existing credit analysts. In addition, Lori serves as the Process Coordinator for QNB’s Business Manager® product as well as Secretary of the Special Asset Committee. Quakertown, PA (January 11, 2019) QNB Bank has promoted Justin Hartrum to the position of Senior Vice President, Commercial Lending Officer. In his role, Justin is responsible for business development of commercial loans, traditional banking and cash management services, and loan portfolio management. In addition, Justin serves as the Program Manager for QNB Financial Services. Justin has been with QNB for 12 years, previously serving as a credit analyst and most recently as Vice President, Commercial Lending Officer. He earned his Bachelor’s degree from Bucknell University followed by an MBA from Lehigh University. Justin is currently furthering his education at the ABA Stonier Graduate School of Banking at the University of Pennsylvania. Justin lives in Easton, PA with his family. He remains active in his community where he serves as a Member of the Rotary Club of Saucon/Center Valley, Treasurer for the Rotary Club of Saucon Foundation, Inc., and President of the East Central PA Chapter of the Risk Management Association. Justin is also an assistant wrestling coach for the Wilson Youth Wrestling Association. Quakertown, PA (December 13, 2018) Jonas Homa was recently named Vice President, Commercial Lending Officer at QNB Bank. He is responsible for business development of commercial loans, traditional banking and cash management services, and loan portfolio management. Jonas has been in banking for 17 years. In his previous employment, he served as Vice President, Commercial Lender for OceanFirst Bank. Jonas earned his Bachelor of Science Degree in Accounting from West Chester University of Pennsylvania. Jonas lives in Perkasie, PA with his family. He remains active in his community where he serves as a volunteer and coach for Pennridge Little League Baseball as well as Pennridge Yellow Jackets Soccer.